splendid isolation: Gentlemen, start your engines! Or at least give the ignition key a tentative turn. I'm not saying that today's triumphant return to Ben Vrackie has set us up for a renewed assault on the Munros, with the consequent edge-of-seat-blogging for an expectant nation that such would entail, but it was a good day out. Ninety minutes to Moulin, Three hours up and doon the hill, and back home for 2:00pm. Corbetts and Brownie points, that's the ticket. Just don't ask how sore my legs are, eh? 2. If you want to see what Ben Vrackie actually looks like, you'll need to rewind a year. And about time too! Though I'm thinking we should develop an interest in sub 2k's, Graham's and wee Corbetts until my lungs and legs get used to the whole idea of going out again - and I'm saying nothing about the damage to my liver caused by all this not getting out. I know. 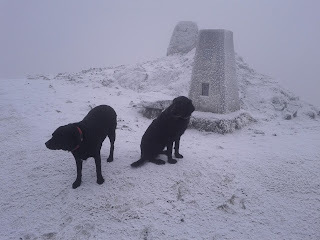 It's remarkable to think that in the summer, just a few short months ago, we were both in absolutely tip top physical hill-climbing condition.